How Much Does Beauty Cost? I guess that’s an unanswerable question, isn’t it? How can you put a price on what each of us deems beautiful? Since we’re quilters, our stash is a beautiful thing, one we would loathe to put a price on. Those quilts are works of love going to cherished family members, people in need, and our own tables. But the supplies do cost, don’t they? They may be far less expensive than you think, and here’s why: by making a few small changes, you can afford far more beauty in your quilting supplies than you ever thought possible. I know, because I’ve done it. My husband and I both started small businesses years ago, and we lived on our savings for four years. Yes, that’s right. Four entire years. We weren’t independently wealthy; we simply were people who saved on a consistent basis, watched what we spent, and were able to benefit later when we wanted to develop our own businesses. During that time, I still bought fabric, thread, batting, notions, and books. All of it. But I did so on a budget. So, if you think beautiful quilts are out of reach because times are tough, think again. I’ll show you how you can do it. My latest book, The Frugal Fabriholic, gives you a 12-step plan for saving more cash for your quilting stash. You can get all the details on the website here, and I’ll be posting a few tidbits and sketches on how I saved my family $13,000 last year and was able to use a portion of that for my quilting supplies. Here’s a sketch from my journal that gives an example. Symphony on the Green is an event we enjoy each year, and it’s free. I also cooked a picnic dinner, instead of having it catered. I saved enough from that one night to splurge on some lovely fabric supplies. This entry was posted in Books, Home, Quilting and tagged Books, frugal fabriholic on June 17, 2010 by mpeagler. My Kindle’s Here! My Kindle’s Here! I’m like a kid at Christmas – my Kindle’s here! After putting off buying one for too long, I’ve finally succumbed to Kindle love. I’m an avid reader, and I couldn’t wait to get my hands on the Kindle once Amazon lowered the price. Now it’s here and guess who downloaded the first books? My sons! My younger son downloaded a classic Beverly Cleary book Ralph S. Mouse, and my older son downloaded the latest Alex Ryder novel. This was after they tried a sample chapter first. I took both boys to the doctor this morning with coughs and sore throats, and they devoured books on the Kindle en route. It was beautiful silence. A nice surprise – some quilt books are available on the Kindle. Mostly the state documentation books, like Tenneessee Quilts, and all the photos are in black and white, but it’s lovely to have some quilt love on the Kindle too. So excuse me, but I have to catch up on my reading. And my first Kindle book? The School of Essential Ingredients by Erica Bauermeister. It’s a great novel about cooking and relationships, and I wanted to read it over the summer but couldn’t find it locally. The Kindle makes reading so easy, especially for book lovers. Goodbye Law & Order, hello novels. This entry was posted in Books, Breaking Quilting News, Home, Quilting and tagged Books, kindle, quilt, reading on November 18, 2009 by mpeagler. February’s Quilts & Creativity newsletter went out this week, and I can’t wait for you to see it. It includes last-minute details on my book launch this Friday, an opportunity to win a color consultation with me, the scoop on fresh, innovative spring color palettes, a sneak peek at a new product I’ll be announcing at the end of this month, an opportunity for me to visit your bee group in March, and a fabulous burger recipe. I’ve really changed the way I develop and offer lessons on this blog. I save the detailed lessons for my newsletter, as it’s easier to give a deep treatment to subjects in a format that spans several pages. I chat about personal stuff, announcements, ideas, and anything else that comes to mind on the blog. But if you want the lessons, sign up for the newsletter by clicking on the Newsletter tab at the top of the blog. You can see back issues of the Quilts & Creativity newsletter here. This entry was posted in Artist Dates, Books, Color Lessons, Color Mastery, Journals, Newsletter, Quilting and tagged artist dates, Bee Groups, Books, Color Mastery, Journals, Newsletter, Quilting on February 18, 2009 by mpeagler. Present Innovative Content. Groundbreaking ideas rarely come from big, established companies, because they’re too entrenched in their own systems. Color Mastery takes a totally unique and innovative approach to not only color in quilting, but how it provides a road map and focuses on exercises and building great color skills. Hire the Best. I’ve published two books on my own, and managed a publishing group, and I know how essential hiring the best talent is to the outcome of any book. Many self-publishers do everything themselves and that’s a mistake. I hired the best quilt photographer, illustrator, book designer, technical editor, and content editor I could find. And it shows. Color Mastery is beautiful, a great read, has excellent photos, and easy-to-follow instructions. Know Your Audience. That’s the first rule for any writing, is to know who you’re writing for. I know from my quilting classes that all quilters, from newbies to art quilters, have burning questions about color. I also know they make a diverse range of quilts, from originally-designed art quilts to baby quilts to reproduction quilts, and they all need color advice. Color Mastery includes color wisdom any quilter can use, not just quilters who want to make vibrant, in-your-face with color quilts. Become an Entrepreneur. The world of publishing is much more accessible with the internet. I can talk to a printer in China, my photographer in California, and my Brazilian illustrator in Washington state easily. And I can develop distributions channels far more efficient than other companies, saving you money and making the book more affordable. Develop Relationships. 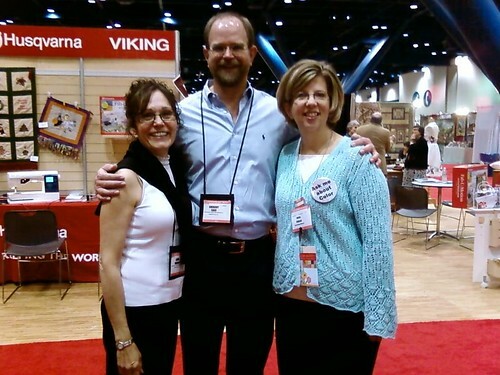 I meet everyone involved in the quilting industry, from quilters in my classes, to shop owners, quilting wholesalers, book authors, pattern designers, and fabric manufacturers. Because I’m involved in every aspect of my book, from content, to print, to sales and distribution, I’ve met wonderful people I never would have as an author insulated from the industry. Get the Attention You Deserve. My literary agent represented over 100 authors. Big publishing companies produce hundreds of products, from books to CDs, each year, and you get a miniscule slice of their attention. Most authors don’t realize how little time they’ll actually spend with their editors. By publishing myself, I get face time with my team when I need it. I don’t feel lost in a revolving door of authors and products. Build an Evergreen Title. What’s that? An evergreen title is one that stays in print a long time, rather than being a fad than lasts only a year or two. After writing a couple of books, I realized it took just as much effort to write a book that would last for 10 or 20 years as it did to write a book about a fad that would last only one to two years. And when I buy books, I go for longevity as well. Trends are fun, but the good stuff lasts and hold lessons for me for years to come. Earn More. Most authors are horribly surprised at how tiny their royalty checks are and how long it takes to actually get them. It’s not unusual to wait 18 months to two years for your first royalty check – the author is the last to be paid in the publishing chain. And if you get an advance, you may never earn more than that. Most authors also don’t realize they must buy copies of their own books from the publisher, so if you want to speak and sell your books, you must buy them first. As an independent publisher, I keep far more of my books’ earnings, and I get them sooner. However, as the publisher I also put up the capital to hire the team and print the book. Ultimately, I made an investment in myself. Turn Your Book into Opportunities. A book is just the beginning of my career, and it serves as the ultimate business card. From one book I’ll develop additional products, book speaking engagements, be offered opportunities to design quilts, fabric, and who knows what else? Because I have closer relationships with players in the industry, I’m one of the first they think of when it comes to partnerships. Own the Copyright. Never, ever write a book and let the publisher own the copyright. I’m devastated when I see women work tirelessly to develop a book and the quilt projects in it, only to practically give it away to a publisher who then owns the copyright. Basically, you’ve just done a “work for hire” and you have no rights whatsoever to that work ever again. I value my work and talent far more than that, and so should you. Don’t give your work away. I know I had loads of questions as a newbie author, and it’s tough to know who to trust. Join me over at LibraryThing’s author chat and I’ll be happy to answer any question you have about quilting, writing, or the publishing process. See you there! This entry was posted in Artist Dates, Books, Color Mastery, Publishing, Workshops and tagged Books, Color Mastery, Indie Press, Publishing on February 6, 2009 by mpeagler. Today’s gift is the beautiful book Teapots 2 Applique by Kay Mackenzie of Quilt Puppy Publications. Kay has written an entire line of applique books, each centered around a different theme. Teapots 2 to Appliqué includes 16 creative teapots to appliqué using your favorite method. Includes a sampler quilt pattern if you’d like to show off your whole collection of teapots. You can design your own teapot-themed wall quilts, table runners, placemats, tea towels or garments. The designs are a terrific way jump start to your creativity! No two projects will be alike as you search for that perfect fabric to represent a beautiful china pattern. And the winner of yesterday’s Creative Grid 16.5″ ruler? Martha B. come on down! You’re the big winner! Send your mailing address to me at maria [at] colormastery [dot] com. Congratulations! This entry was posted in applique, Books, Twelve Days of Christmas Giveaway and tagged applique, Books on December 9, 2008 by mpeagler. I adore books. Really. I would buy books before food and clothes, and when I go into a quilt shop I always look at what the new books are. So I was excited to see USABookNews.com’s picks for best Craft/Hobbies books. Take a peek and see how many quilting and sewing-related titles are here. This entry was posted in Books, Machine Quilting, Quilting, Sewing Patterns and tagged Books, Quilting, Sewing Patterns on November 19, 2008 by mpeagler. You are on the email list, right? Well, if not, you can sign up here. Really. Great stuff this month. Hope you don’t miss it. This entry was posted in Artist Dates, Books, Color Lessons, Machine Quilting and tagged artist dates, Books, Color Lessons, machine quilting on November 14, 2008 by mpeagler. 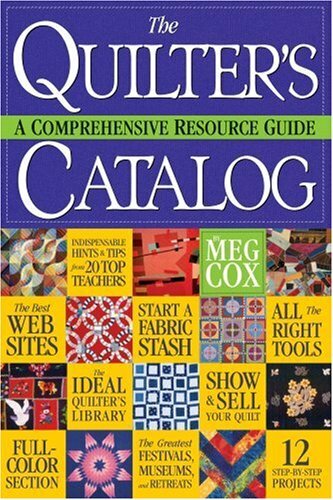 I profiled Meg Cox, author of The Quilter’s Catalog: A Comprehensive Resource Guide, months ago here, and I attended her session at Fall Quilt Market. Meg is the new evangelist for all things quilting, her goal being to create new quilters in the 85% of American households that don’t have one. Can it really be that high? Meg holds “Learn to Quilt” parties where she teaches women and girls how to quilt: just the basics like how to pin, piece by hand, and tie a quilt. Oh, and they serve “Quiltinis” – a mock cocktail. She approaches nontraditional venues such as bookstores, mother’s groups, and other social gathering locations where women hang out. The interesting comment Meg made was this: Quilters can be our own worst enemies when it comes to growing the quilting community, because we make things so complicated. You know what? I agree. Go to any guild Show and Tell and the oohs and aahs go to the 3000-pieces Grandmother’s Flower Garden, the king-size Mariner’s Compass, or other such masterpiece quilts. And we should be impressed. But what happens when a quilter holds up a Turning Twenty or Yellow Brick Road? Quiet smiles and nods. Move on. Seen it. Let’s embrace all quilters: new, expert, traditional, art. We all love fabric, creating beauty, and the comraderie of other quilters. Let’s spread the word! This entry was posted in Books, Breaking Quilting News, Quilting and tagged Books, Breaking Quilting News, Quilting on November 6, 2008 by mpeagler. Multimedia message, originally uploaded by Colorful Quilter. Ok, so he’s The Photo Man for The Quilt Show too. Gregory took all the gorgeous photos of the quilts in Color Mastery, and he is a large part of why the book turned out so beautifully. After all, the colors in the quilts had to be not just lovely to look at, but accurate as well in a book on color for quilters. And Gregory and his wife Elena Morena worked diligently to bring you gorgeous color, page-after-page. They had a copy at Market and it was pure Gwen – gorgeously designed quilts, all done in solids, and hand-quilted. I’ll be ordering my own autographed copy. My Christmas wish list is getting bigger and bigger! This entry was posted in Books, Breaking Quilting News, Machine Quilting, Quilting and tagged Books, Breaking Quilting News, Quilting on November 3, 2008 by mpeagler. Color Mastery Now Available for Pre-Order! It’s a big day in the Willow Ridge Press studio. Color Mastery is now listed on my distributor’s website at AtlasBooks.com. You can pre-order your own copy and be one of the first to hold it in your own hands. I decided to use a distributor for book sales and fulfillment so I can concentrate on what I enjoy most: quilting, teaching, and writing. I focus on what I do best, and AtlasBooks does a much better job of packing and shipping the book to you than I would. Color Mastery is also available for pre-order over at Amazon, and will be in your local quilt shop in February. What if you don’t have a local quilt shop, like in my town? You can always order online, or directly from me, and I’ll even autograph it. When I wrote Color Mastery, I challenged myself to make beautiful quilts with extraordinary color using only the fabrics in my stash. That has become even more important lately with the recent economic news: when food, gas, and energy are rising and incomes are dropping, what happens to the “fun stuff” like buying fabric and quilting? Usually it’s the first to go! But it doesn’t have to. That’s where Color Mastery comes in. It’s the only quilting book on color designed to be used with your stash, showing you it is possible to squeeze better color from the fabrics you’ve already got. a collection of every technique (over 50!!) in Color Mastery for getting better color from your stash. These two bonuses are a special thank you to my readers that order the book early. That way, you can go ahead and get started on fantastic color from your stash, even before the book arrives. Color Mastery: 10 Principles for Creating Stunning Quilts – $26.95 (click here to pre-order) a $67 value with your two bonus gifts! If the site is busy, please try again! Just send me (info@colormastery.com) your AtlasBooks or Amazon transaction number, and I’ll email the special gifts to your inbox – you don’t even have to walk to the mailbox. I’ll even add a third special gift if you include the email address of your quilt guild newsletter editor, so I can tell them about some free articles available from Color Mastery to guilds. Don’t you just love getting surprises, exclusively for you, in your mailbox? This entry was posted in Books, Breaking Quilting News, Color Mastery and tagged Books, Breaking Quilting News, Color, Color Mastery on September 26, 2008 by mpeagler. Olympics in China: That’s Not All! The Olympics aren’t the only exciting thing occurring in China. This package arrived on my doorstep from Hong Kong: the bluelines for Color Mastery. I sure wish I knew what this said. I’m sure it’s something quite boring, like “folio 1 of 7,” but the writing looks so elegant. I’ve been poring over (thanks Marla!) these proofs to make sure the colors are dead-on accurate. I drove Gregory Case, my photographer, crazy with my questions and his constant assurances that, yes, the colors would be accurate even though they didn’t look that way on my monitor. Gregory was a therapist before being a photographer, and he told me I needed to take the leap and experience the result, even if I made a mistake. Wow, therapy and photography all from one guy! I took these proofs with me everywhere this week: home, carpooling, even pee-wee football practice. Quite the contrary to Alicia’s experience when she and her husband Andy secluded themselves in a quiet diner to look over hers for her book. I remember those days, bc (before children). Here’s son #2 in his pads and uniform, ready to hit somebody! This is a new experience for me, and not an easy one. Watching my son get knocked to the ground repeatedly during practice is tough. And for 7-year-olds, there’s no such thing as a clean hit: they grab onto anything they can to bring you down: shirt, mask, hit from the back. My husband tells me the goal for son #2 is to get through practice without quitting or crying. He will, but I might not. This entry was posted in Books, Color Mastery, Home, Quilting and tagged Books, Color Mastery, Home on August 22, 2008 by mpeagler.